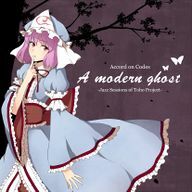 A Modern Ghost is a doujin album by Accord on Codes released on 2012-05-27 (Reitaisai 9). It features instrumental arrangements of themes from Embodiment of Scarlet Devil, Perfect Cherry Blossom, Phantasmagoria of Flower View, Shoot the Bullet, Scarlet Weather Rhapsody and Double Spoiler. This page was last edited on 22 April 2018, at 19:54.